The Double Vision show at Lion and Lamb Gallery, curated by Katrina Blannin and showing until 14 July 2012 is an excellent selection of paintings by abstract artists working today. I enjoyed every work in this show, so excuse me if I come back to it more than once, to comment about another painting or two. 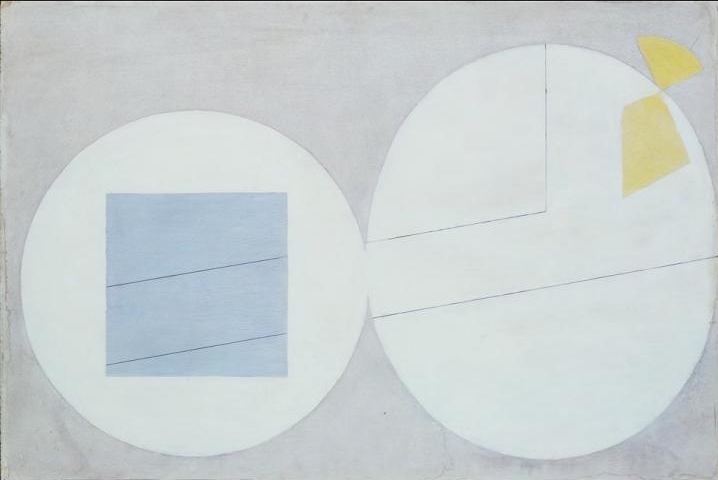 Geoffrey Rigden’s Erik reminds me of a painting I saw at the Hepworth Wakefield last year by John Piper: Forms on a White Ground, 1935. It may simply be that they both contain ‘forms on a white ground’ and that the forms could be people, even whilst so clearly not being. The connection is no doubt an entirely personal one. Seeing this Rigden painting triggered my experience of the John Piper, of how ‘big’ the little painting had seemed to be, and how strange. I love the informality of the geometry, its ‘painterliness’ and the playing with space. My eye gets taken into those spaces in the centre and the figure (three rhombus shapes combined) on the left appears to be in front of the one on the right (again, not really a figure so much as four black shapes that my eye groups together and interprets as a figure), that ochre square in the bottom left is definitely in front of the red/brown square, until suddenly the white space in the middle becomes figure, softer and slightly curved, which for less than a second might be a female figure, or a face. 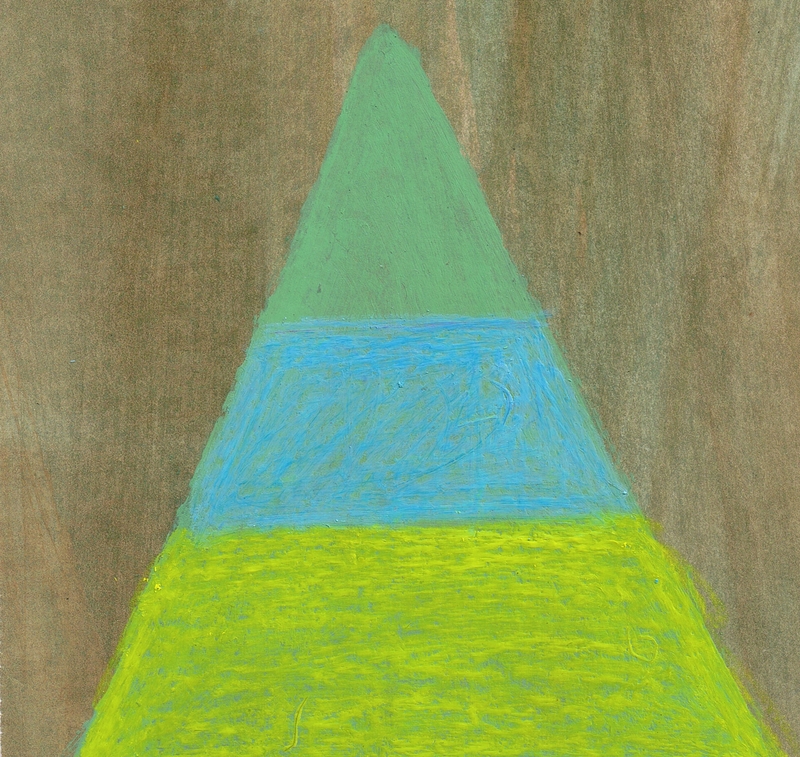 And then my eye rests on the odd little cluster of triangular shapes towards the top centre of the painting which could be a painting all of its own, a painting within the painting perhaps, and then the upper pointing triangle takes me up and around the whole again. I have no sense that this is “abstracted from” anything, yet it does have some connections to picture-making and composition that I think of as “figurative” even within the larger frame of abstraction. I find less picture-making in the painting by Estelle Thompson. I first saw paintings by Thompson at the Angel Row Gallery in Nottingham in 200o and I was so impressed by them that I could hardly stay away. I worked near there at the time, so visiting them became my regular lunchtime activity for the duration of the show. Those paintings were stripe paintings, quite spectacular, eliciting lots of optical excitation. They grabbed your attention in a way that the painting here does not. It is almost as if Thompson says “now I have done that successfully, what would its opposite be like?” this painting rewards my attention rather than grabbing it. It is double in that we very clearly have a top and a bottom “half”, there’s also the duality of black and white VS colour (black and white is a major sub current in this exhibition), or rather it seems to highlight how black and white behave as colours. 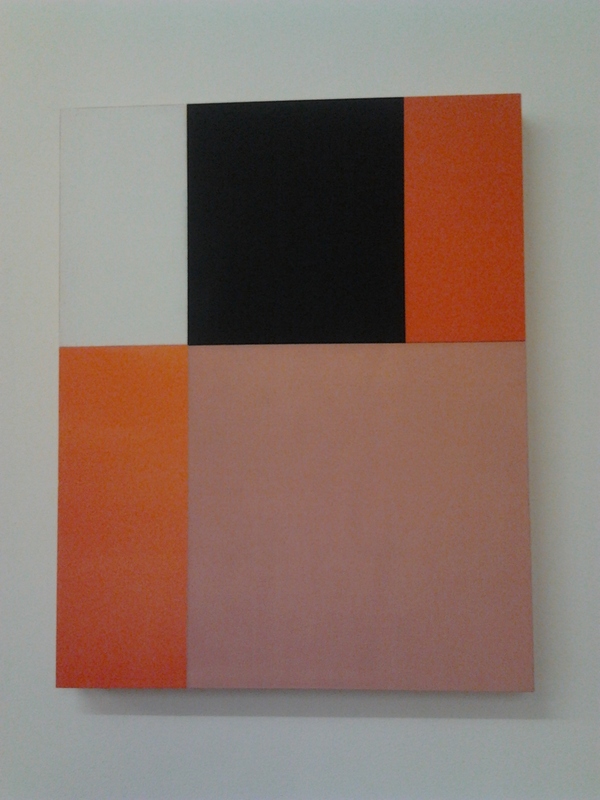 The red, black and white “half” of the painting looks harder to me than the bottom “half” of yellow/orange and a peach/flesh colour. The fleshy area also looks softer than any other section in the way the paint is applied too. This seems to contribute to my sometimes seeing the bottom “half” of the painting as sitting forward of the top “half” and sometimes seeing the other harder shapes as framing the soft fleshy area. And then the black and red seem to join forces with the yellow/orange to create a form in distinction to the white and flesh colour that become its ground. 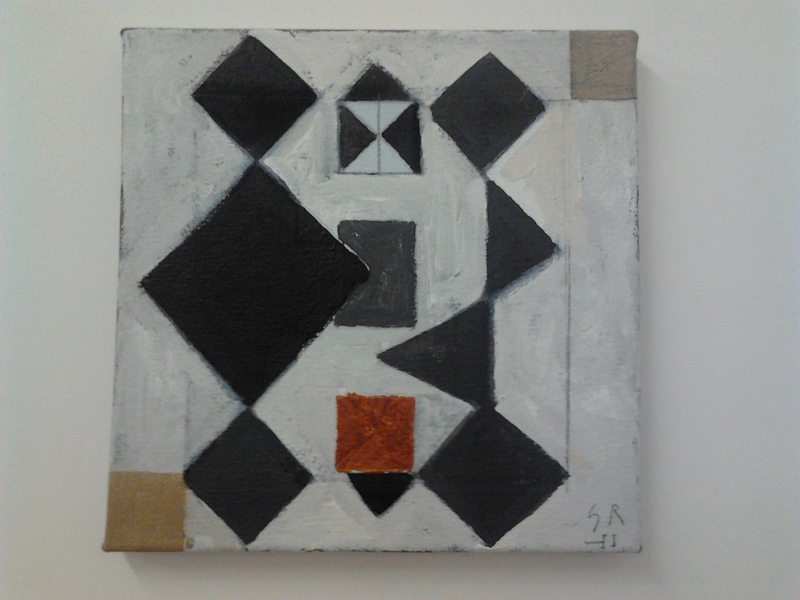 I hope it is not too grand to say that when looking at this painting I find that I am thinking first about what a strange thing this is but then about what a strange thing I am, that I can find many different ways of seeing such a “simple” arrangement of colour/shapes. Does the title Look at Me Now and I am Here refer to this conversation I am having with the painting and with myself? I am reminded of that cartoon by Ad Reinhardt where a viewer of an abstract painting in an art gallery is mockingly asking “what does this represent?” only to be answered by the painting “what do you represent?” but the experience is more gentle than that. It is more like that greeting of West African origin that I came across in an NLP workshops with Robert Dilts, where one person says “I see you” and the other replies “I am here”. Until we are seen by another we do not yet exist, and that seems to be what’s going on here. This painting exists when I pay attention to it, and it rewards my continued looking with visual pleasure. The other artists in this exhibition are: Chris Baker / Dominic Beattie / Isha Bøhling / Ian Bottle / Katrina Blannin/ Alice Browne / Simon Callery / Keith Coventry / Natalie Dower / Tom Hackney / Jumpei Kinoshita / Hannah Knox / John McLean/ Sarah McNulty / Neil Mendock / Mali Morris/ Jost Münster / Selma Parlour / Dan Roach / Danny Rolph / David Ryan / Julian Wakelin. Walking towards Model Studies the Thomas Demand exhibition at Nottingham Contemporary, and having forgotten whose work was on show, I felt sure that I was walking towards an exhibition of abstract paintings. 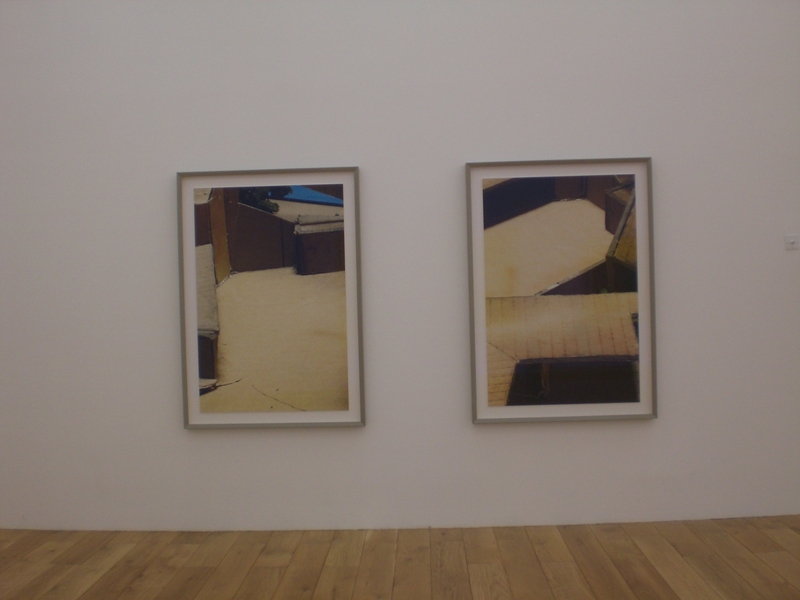 In fact, they are large photographs of small architectural models. The scale tends to flatten out the space and to produce large areas of lightly modulated colour, hence the resemblance to American abstract paintings of the 50s and 60s. When you get a bit closer the space in the photos becomes more apparent, it reminds me of the space in a cubist paintings now. I can imagine the artist bending a craning to get into the tiny models attempting to experience it for himself, in a way similar to the cubist modelling of space, as experienced in time. Demand is known for his photographs of life-size models, made by him, of architectural interiors like the Oval Office, paper models which are destroyed after being photographed. In these new works the models he photographed were made by the architect John Lautner (1911 – 1994), and discovered by Demand in the archives of the Getty Research Institute when he was artist-in residence there. In this short video clip he talks to Alex Farquharson, the Director of Nottingham Contemporary, about how he found these models and about his interest in the status of the model: far from being a diminution of reality modelling is our way of perceiving the world and communicating our experience of it to others. (In NLP we think of models and modelling in a similar way. We make models of how people do what they do well so that we can teach it to others.) It occurred to me that these photographs, themselves 2 dimensional models, document the process of modelling. They show us something of how in modelling we alter scale, freeze time, distort space in order to ‘understand’. Rachael Pinks asks an important question and comments on the relationship between what in NLP and Self Relations we might refer to as ‘cognitive mind’ and ‘somatic mind’. It could be argued that technology separates cognitive thinking and somatic doing, attempting to mediate them by inserting ‘controlling’. Capitalism arranges them hierarchically, with thinking at the top, doing at the bottom and controlling in the middle. ‘thinkers’ have power and wealth, whilst ‘doers’ generally lack both. I want to say that art integrates thinking and doing, though I am aware that it is not always the case, take conceptual art for example, are not thinking and doing often separated along exactly the same lines as in capitalist production? 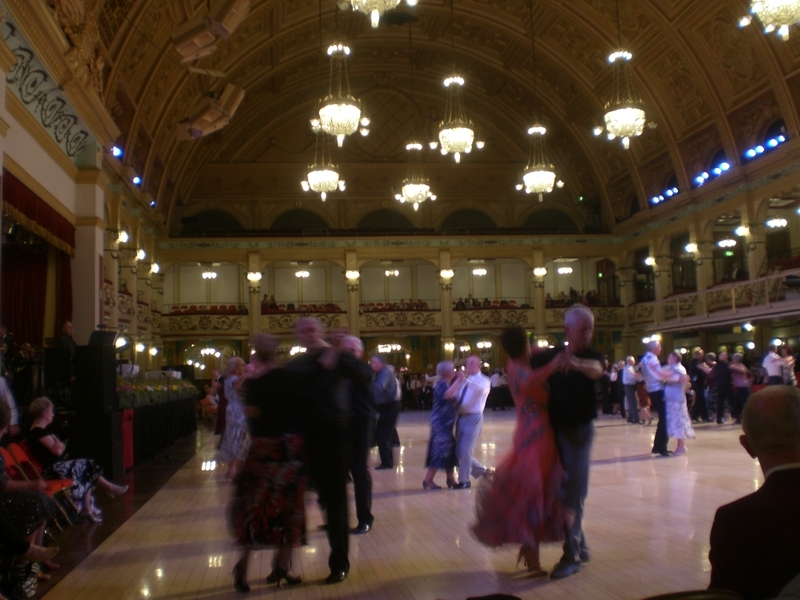 At the Blackpool Sequence Dance Festival 2011, in the Empress Ballroom of the Winter Gardens, attempting to learn brand new sequence dances, with a large group of people, I found it very difficult. It was wonderful and I loved it, especially as others took pity on us and helped us out, yet I really struggled to pick up 16 bars of steps in half an hour. I could see many people, 20 years my senior and more, finding it quite easy to do what seemed an almost impossible task to me. What was it that made us different? Maybe we could put it down to learning styles: this is not my favoured way of learning, I would rather read instructions first or have them explained to me in an environment where I could ask lots of questions, and then slowly piece the whole together part by part. I also seemed to suffer from ‘performance pressure’ that may have been absent in a smaller group or on my own. It was possibly David Kolb that introduced the notion of learning styles, along the lines of: learning has a cycle of four stages and though all stages are required we may have a preference for a certain stage more than others. I have the impression that Honey and Mumford‘s learning styles are more or less the same as Kolb’s, but with more accessible labels, so we have Activist, Reflector, Theorist and Pragmatist styles. One implication of the theory is that we learn best when our own style is adequately catered for, Activists and Pragmatists preferring to learn by doing, Reflectors and Theorists favouring a more thinking approach etc. Learning professionals closer to NLP might use the distinctions Visual, Auditory and Kinaesthetic as learning styles. But isn’t this somewhat limiting? “I don’t learn that way” “It’s not my learning style” could easily become an excuse to prevent further learning. Isn’t it rather that what is needed is learning at a higher level? Gregory Bateson proposed that there are levels of learning, where Learning 0 is an habitual automatic response to a given stimulus, Learning 1 is a trial and error process of adaptation to the given environment, Learning 2 is a process of corrective change in the set of alternatives from which choices are made at level 1, and Learning 3 (which rarely, if ever occurs) is about our whole process of forming, exchanging and losing level 2 habits. Learning how to learn in the situation I described above would be Learning 2, which would then mean that on future occasions I could participate more successfully in the trial and error process of learning the new dances in the large group in only half an hour. One way to do this would be to model the strategies of other dancers/learners, which would I suggest also be a more sophisticated use of NLP. I borrowed the term ‘generative collaboration’ from Robert Dilts, who is using it a lot just now. One of the best workshops I ever attended was one of his in 2006 at PPD Learning, London, entitled The Artistry of Change. The many activities we did included one where, working in pairs, taking turns, one person would make a physical gesture or movement, and then the other person would repeat it and add some more, the first person would then copy what had been created so far and then add more, to and fro, the sequence of gestures quickly becoming a complex pattern or dance. It was great fun, over 100 people doing weird things all over the place … and laughing…lots! During that exercise I learned what an effective collaboration could be like. A few weeks ago Joshua Sellers and I met via the medium of WordPress blogs, and he suggested that we collaborate on a video, featuring his music and my art work. I was already a fan of his music and had previously suggested that what he was doing in sound was what I had been wanting to achieve visually. It hadn’t occurred to me that we could put the two together (though it seems obvious now). you can see the result of our collaboration at earscapes. The title refers to Winifred Nicholson’s address in Paris, where she lived from 1932-8. She went there specifically to learn about abstract art. There she befriended artists such as Piet Mondrian, Constantin Brancusi, Jean Arp and Jean Hélion. Around this time she wrote in Circle that ‘[t]he nature of abstract colour is utter purity – but colours wish to fly, to merge, to change each other by their juxtapositions, to radiate, to shine, to withdraw deep within themselves.’ She claimed that the painting was about colour and the shapes could take whatever form they wished. This sounds like an approach to abstraction that I learned from Mali Morris many years ago, where you place the colour and allow it to suggest its own form. This requires a ‘dialogue’ with the painting as it develops. It seems now to relate to a metaphorical language pattern I have come to know from NLP, as a ‘selectional restriction violation’ where, for example, an inanimate object might be ascribed qualities that it could not logically have, e.g. “my bed is missing me”. The painting is considered to have a life of its own, it suggests and leads, it converses with the painter. This process of projection, I suggest, induces a natural trance state in the artist as s/he works on the developing painting, and is part of the ‘content’ of the abstract work. The question I have is whether in viewing the painting (so long as we actually look at it rather than just walk by) do we enter a similar trance state? 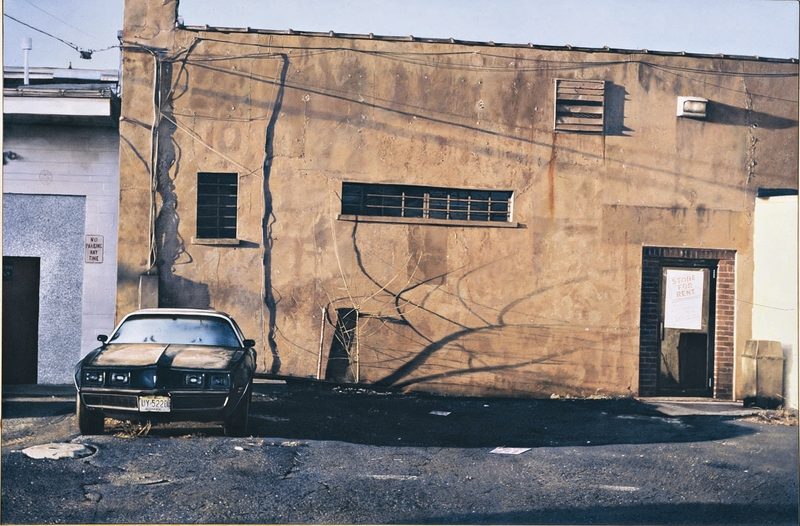 The photo-realist paintings of John Salt have something approaching the miraculous about them. Could they really be paintings? Pictures of photographs of cars, made with airbrush, they look untouched by human hands. In the Greek Orthodox tradition isn’t acheiropoieta the name given to icons not made by human hands? They were allegedly painted by saints, or they appeared miraculously like Veronica’s Veil or the Turin shroud. Maybe the images were made of the salt from Jesus’ sweat. But these are no icons, though my eye was conned from time to time into thinking that I was looking at very large photographs rather than paintings. In some senses they are not even images, the matter of fact way in which they are produced and presented, renders them artless, real, objects, to be viewed but not worshipped. And in that they are also images, they are images of images, the subject matter of which is artless, found, material as opposed to image in the sense of advertisement, shiny gleaming mirror. Other photo-realists seem more interested in images of this kind. 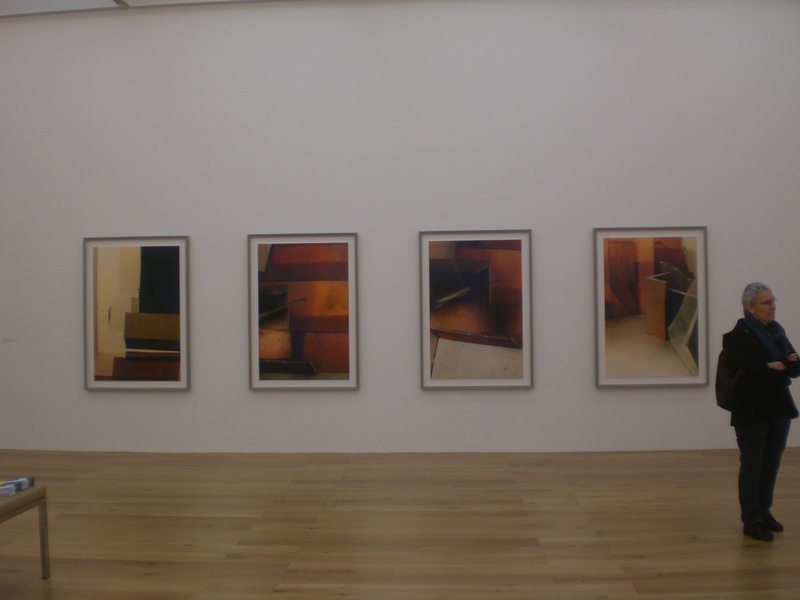 Ikon Gallery Birmingham is showing work by John Salt until 17 July 2011. I wandered through the two rooms of paintings, 18 in all, spanning 42 years of Salt’s artistic output. Not wishing to be impressed (my mission, you may remember, is to view abstract paintings outside of London), I found myself confronted by a body of work that I was hugely impressed by. I lingered longest on the 2001 painting Tree, a solitary vehicle, parked outside a disused store, next to a weedy self-seeded tree, the long shadows suggesting evening or morning. I feel it should be evening symbolically, but seeing how the windscreen is condensed it looks like it may be morning. The shadows emphasise the whereabouts of the cables running up the side of the building and bring attention to the puny tree, projecting a larger than life image of it onto the façade of the building, rather like the projected image of a photograph onto a large canvas, the standard technique for drawing in photo-realist art. The car and the store are a similar colour, terracotta, or rust. Knowing even a little about this kind of work I think it highly unlikely that Salt is interested in the symbolic or metaphoric elements in the piece, and maybe these also are projections, but I find it difficult not to see in the terracotta, a symbol of rust and decay, also hinted at in the parked or abandoned car. And I find it difficult not to see in the tree at least a gesture of hope, however futile. I feel sure that this is not the content of the picture as far as the artist is concerned. However, I think the NLP mantra ‘the meaning of a communication is the response you receive rather than the intention you had for it’ applies here. I found I could also interpret the painting in abstract ‘colour-field‘ terms, enjoying the large expanse of orange, framed above by the light blue band of sky, and below by the darker blue/grey of the tarmac. Then becoming aware of the lemon yellow rectangle on the right hand edge, echoed by the adjacent dark grey or black rectangle of the door, within which is a cut-out of white. 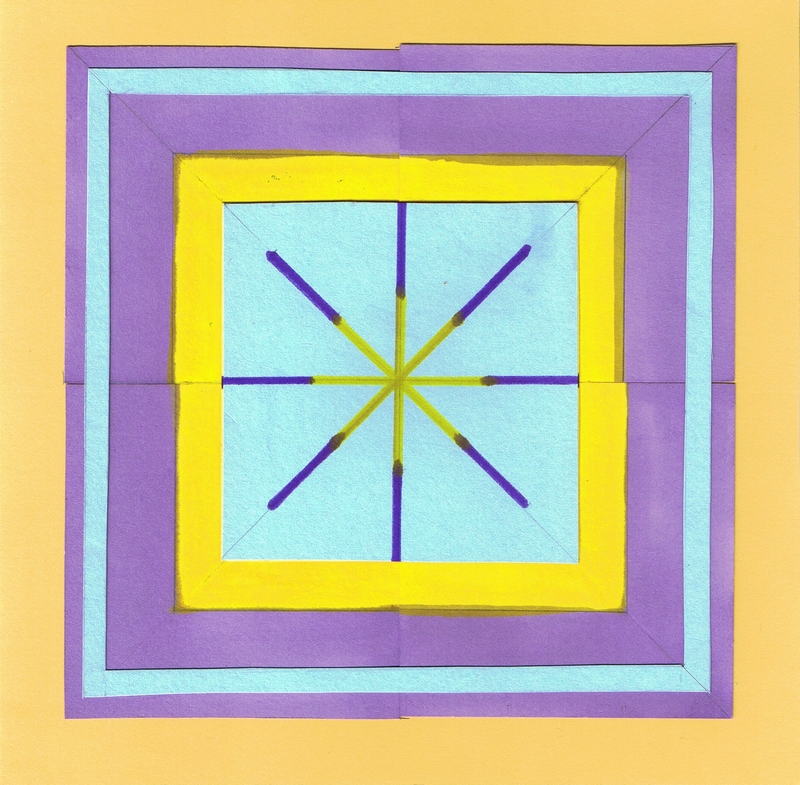 At the opposite side, there are similar rectangles in almost complementary colours of blue and lilac. In this reading of the painting the car plays almost no role at all. I realise that here I may have been compensating for the abstract paintings I did not find! Another reading might concentrate more on the signs. I have already mentioned the index sign of the rust colour and the long shadows: signs of decay and death, the icon sign: the painting of the photograph, and there are also the symbol signs represented in the photograph itself: “No Parking Any Time” and “Store for Rent”. Well, I had parked myself in front of it for long enough and there were other paintings to see, and work to do. So I left, hoping I would get chance for another viewing before 17 July.